Palazzo Perabò is a prestigious 16th-century building located in Cerro, a town in the municipality of Laveno Mombello on the shores of Lake Maggiore, on the point of the headland protruding into the lake waters south of Laveno. Equipped with a marvellous double cloister walk (recently renovated), the building has endured a complex, curious and eventful history. Palazzo Perabò was built on the wishes of counts Guilizzoni from Cerro at the end of the 1500’s, when the family was given the Seigniory of Contea. Over the centuries, ownership of the building was transferred several times until it was put up for auction and purchased by Don Leopoldo Perabò. He transformed it into a moral body. After the death of Perabò, the building was used for different purposes: old people’s home, surgery and agricultural institute. In 1968, the municipal administration of Laveno decided to purchase the building with the idea of using it for a valuable collection of local pottery. 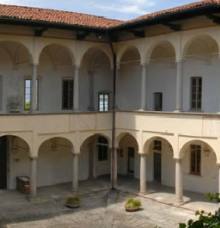 9 May, the museum was inaugurated under the name Civica Raccolta di Terraglie (Civic Collection of Earthenware). The Museo Internazionale Design Ceramico (MIDeC), or Civica Raccolta di Terraglie, is just homage by Laveno Mombello to its pottery tradition - a right and proper tribute. Since 1856, the town has been home to thousands of craftsmen - some even internationally-acclaimed – who created both beautiful objects for everyday use and sophisticated, quality, artistic products. The collection’s main core is that of Società Italiana Ceramiche, which later became well-known Richard Ginori. The numerous museum halls display umbrella holders, vases, plates, sets, pieces in Liberty style and even - albeit rare - sanitary fittings!